Explore Zimbabwe’s largest game park! Located on the border of Botswana, Hwange National Park amazes you with its sheer size – it covers almost 15,000 square kilometers! The vast park has varied types of scenery – from the semi-arid scrubs near the edge of the Kalahari in the south, to forests, granite hills and valleys of the mopane woodlands in the north. Over 100 species of mammals, including lions, leopards, rhinos and huge herds of elephants, call Hwange home. Best for game viewing during the dry season of August to October, the park offers you day and night drives as well as walking safaris. Set in one of the most remote parts of Hwange National park, the Sinamatella area was established in 1966 and was a former cattle ranch, the area is known for its rocky, hilly county with thick teak woodland. 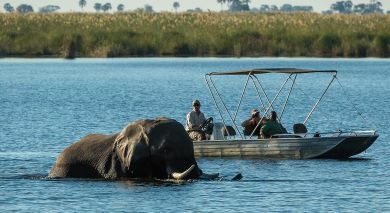 Davison's Camp is situated deep in Hwange National Park, in the south-eastern Linkwasha Concession. Ivory Lodge occupies an ideal position in one of Zimbabwe's richest wildlife areas where herds of many hundreds of elephant are a common sight. Little Makalolo is situated overlooking a waterhole in an ecologically diverse area within the heart of Hwange National Park. Miombo is a quirky and intimate camp that remains a popular destination for travelers who wish to combine a safari in Hwange with a visit to the mighty Victoria Falls. The Hide is situated on a large private concession bordering Hwange National Park to the East. A pair of binoculars and an experienced guide can give you that priceless thrill of seeing one of the Big Five while on a game drive. The private concession at the camp and the African wilderness outside let you participate in a variety of activities to spot wildlife. 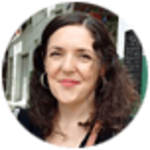 With the guides adding anecdotes to every viewing, the experience is going to be as real as it gets. 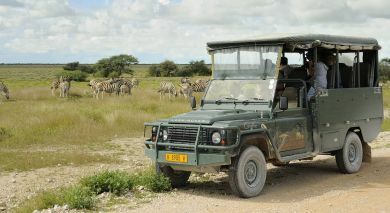 The game drives are organized mornings, afternoons, and nights. You can also choose to go on a bush walk of the neighboring area for a magnified view of the region. Watch predators and preys move around in close proximity of each other, and learn the little secrets of the natural world unfolding before you. Located in the heart of one of the best game viewing areas in Hwange National Park, Little Makalolo offers incomparable game drives. Taken twice daily in open vehicles, game drives offer sightings of herds of buffalos and elephants, as well as lions, leopards, wild dogs, and cheetah. Enjoy the unforgettable experience of watching scores of elephants relaxing, and young calves playing with each other in the water. Truly a birder’s paradise, you can also capture varied species of birds in your lens. Explore the park on foot with experienced guides and you might find tracks on black rhinos on your way. With professional guides charting your path, you can silently sneak up to shy animals and take priceless pictures. Strap your laces and get ready to journey into the bush on foot. Watch wild surprises unfold right there as you cover the well-traversed walking trails. The sooner you set out, the better for you – early morning viewings of the African bush in its full splendor can be a matchless way to begin your day. Remember to put in a special request for a walking safari during your reservation. You can also opt for a morning, afternoon, evening or full-day drive to explore the concession. Watch from close proximity as wild animals move around in their natural habitat and a wide range of flora flourish in the harsh environment. 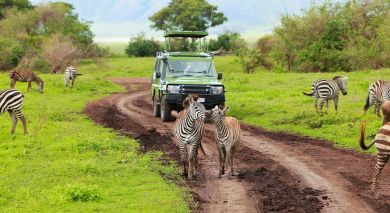 An experienced guide and an open Land Rover can add quite a wild spark to your African holiday. Drive through the private wilderness and watch how predators coexist with smaller animals. Numerous waterholes along the trail ensure sightings of animals, and the varied vegetation will keep you hooked. The Hwange region, known for its dense concentration of game, can be a different adventure altogether when explored on foot. The bush walks let you get really close to smaller animals and flora and an experienced guide can lead you down the most vibrant trails. Soak in the sights and sounds of the African wilderness when on a bush walk. Well-trained guides help you track and follow predators you have been longing to see in the wild. Walk along trails as these guides explain to you finer details of the African bush. You can opt for a game drive during your stay at the camp and witness moments in the wild that are one of a kind. The drives are not time bound and the guides help you reach spots where sighting is inevitable. Whether you explore the African expanse by foot or on a drive, it’s a unique experience to learn how interdependent all living forms are.